The popular TV series showed women asking some serious questions about work, friendship, money and love in the middle of its rom-com fun. But such questions have been asked before, in American and British fiction that explores the experience of women living in tough urban spaces. 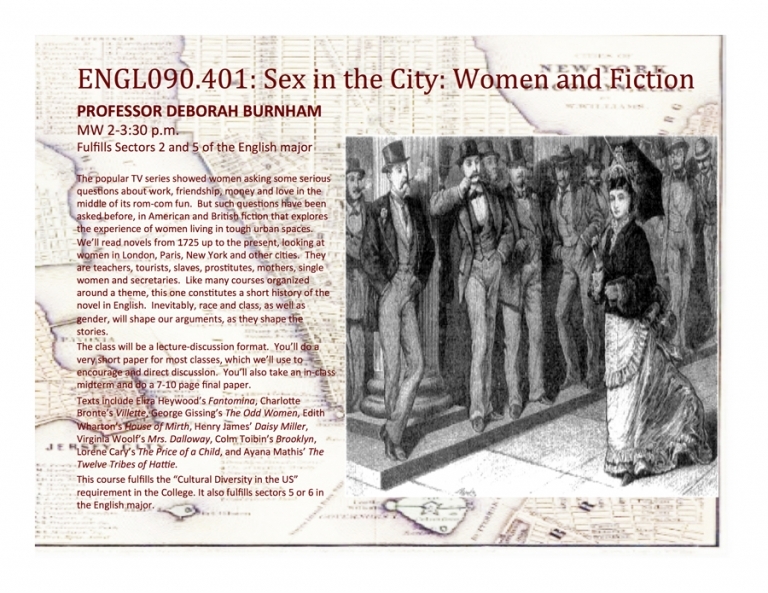 We’ll read (primarily) novels from as early as 1725, up to the present, looking at women in London, Paris, New York and other cities. They are teachers, tourists, slaves, prostitutes, mothers, single women and secretaries. Like many courses organized around a theme, this one actually constitutes a short history of the novel in English. Inevitably, race and class, as well as gender, will shape our arguments, just as they shape the stories. The class will be a lecture-discussion format. You’ll do a very short paper for most classes, which we’ll use to encourage and direct discussion. You’ll also take an in-class midterm and do a 7-10 page final paper. Texts include Eliza Heywood’s Fantomina, Charlotte Bronte’s Villette, George Gissing’s The Odd Women, Edith Wharton’s House of Mirth, Henry James’ Daisy Miller, Virginia Woolf’s Mrs. Dalloway, Lorene Cary’s The Price of a Child, and Ayana Mathis’ The Twelve Tribes of Hattie. Satisfies the College's Cultural Diversity in the the US (CDUS) requirement, as well as sectors 2, 5, or 6 in the English major's core.